Beautiful and aristocratic Catherine de Zegher was born in Belgium, but her curator's portfolio includes work in several continents. She has conducted projects at the Museum of Modern Art in New York and at the Foundation Antoni Tapies in Barcelona; she has been the chief curator of the New York Center of Drawing, the artistic director of Sydney Biennale in 2012 and the curator of the Australian pavilion at the Venice Biennale. Without a doubt, the opportunity to become the curator of the main, prestigious biennale of contemporary art in Russia, presented her with a new challenge. After all, this is a country, which is forever caught in the turmoil of social change and political transformations, where the pulse of news is almost always hot and too rapid. What kind of art does she and her audience need? Catherine de Zegher thinks that it should be slow, muted, bright. 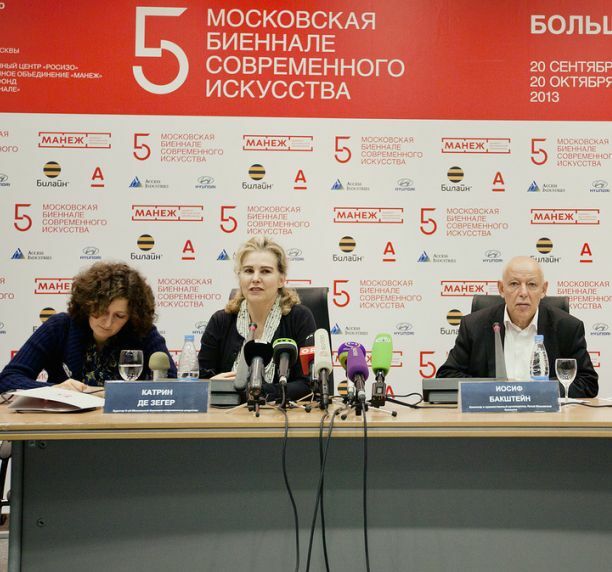 "More Light" is precisely the title she chose for the 5th anniversary biennale of Moscow. Our conversation took place on the second day after the main project of the biennale – her most important curatorial "child" to date – had opened at the "Manezh" exhibition centre. We started talking in a café for the press and participants, but before then Catherine had a long conversation with someone on the phone ("Brussels," her assistant explained). On the table in front of her, there was a cup of coffee and a sandwich. After she finished her conversation, I suggested that she should fortify herself first and then answer my questions. And that is what she did. What do you feel now that everything is in its place and the exhibition has become a whole and has its own face? You know, I still haven't had a chance to see it as a whole. I keep paying attention to separate details which should be fixed. On the first day, when simultaneously with opening the biennale for the press, a children's playground opened at the Manezh, it actually put me in a certain mood. I started seeing the entire huge brightly lit space of the first floor as some beautiful, progressive kindergarten. A place where people are making things with their hands, just like we all did in our kindergarten years. And it is also a place where one feels care, motherly care in fact, for the artists and the audience. Light is also related to enlightenment, is it not? I really like your interpretation, but I am slightly wary of that word "enlightenment". Because here it is probably a slightly different kind of light, which is related to opening up one's awareness. In the past, the main focus was individuality and identity, but I think that it is changing now and switching to subjectivity and relationships, to the way energy is generated among us. It is not generated outside our community, our mutual relationships. For that reason, to me, light is not only something outside, but also something inside. In that respect, I am very interested in the Russian avant-garde; its representatives were incredibly important for forming the sense of the modern and the contemporary art of the 20th century. It is particularly true of Malevich and Suprematism whose representatives in Russia were never really accepted and allowed. In contrast to many Constructivists – Rodchenko, Stepanova, Lisitsky – Malevich believed in inner transformation. He talked about the need to make our everyday life simpler and more ascetic, so that our inner life could become more complicated and richer. Perhaps I should not talk this way, but for me it almost sounds like some relation to Buddhist world view, namely, that we should change inside and if many amongst us change that way, we would be able to carry out other changes – together this time. But, of course, such a way of reading Malevich was too esoteric or too "spiritual" for th West. I think that this part of the iceberg of the Russian avant-garde has remained under water and these ideas of Suprematism have not penetrated the West. The Russian avant-garde was perceived as something visual… and only visual? Yes, after all in Malevich both parts are incredibly attractive: the feeling of the material and the feeling of the immaterial and how he managed to combine them. That I find really inspiring. So I tried to see what would happen now, a hundred years after «Victory over the Sun» (famous Futurist opera, staged in 1913 for which Kasimir Malevich did the set design – Editor's note). How do we exist in the world, what do we share? It seems to me that right now we live in a society where we increasingly depend on each other, where we increasingly have to share with each other. To me, light is creative energy, which accumulates amongst us, i.e. inner light. And it is also the story about how art sometimes "shines" for us. It throws light on the social and political problems. But it works very slowly, and it needs your attention, so you too need to slow down and adjust your perception. I really like Sun Dun's project "Waste Not" with his 10 000 things accumulated in the family of this Chinese artist – from washbowls to tap handles and plastic bottles. To me, he seems to be a direct embodiment of your words at the biennale press conference about the beauty of simple things that surround us in everyday life. In order to understand the message of the biennale – is it necessary to see the entire basic project or can one concentrate on just a few things? I left the main project rather open to interpretation. The main thing is to begin from the ground floor where mostly video projections have been placed and everything is by and large devoted to slowing down time, slowing down attention and slow changes. And then you move through the first floor, through the works by Adam Cvijanovic, which pose the question what painting is today, what it can be like, how it can reflect what is going on in the 21st century. And then there are objects that are related to everyday themes on the one hand, but on the other hand, they are talking about urbanism, migration, lost utopia. Then you see works by young artists, for instance, the micro art of the "Gorod Ustinov" group, which at the same time are in contrast with the blimp hung under the ceiling by Panamarenko; I mean, I am trying to play with the theme of macro-micro; there are small manifestos next to huge, world-generating designs. There is this additional thing that Manezh is a space in which people can feel like they are gnomes. And in this way, we are trying to find a balance. It is concentrating on some sort of very small and personal things which helps us to survive some depressing global things. And then you move to the back part of the exhibition, which appears to be homage to "Victory Over the Sun". These are artists from various parts of the world who imbue their works with some spiritual, inner light. Yes, of course, it is our neighbour. Just like Red Square. In the catalogue, I talk about the meaning of squares in our world, which is increasingly becoming a space for heated discussions. In this exhibition, there is a wonderful picture by Julie Mehretu depicting Tahrir Square. All of this is here, all you need to do is to look a little closer and you'll see it. Artists do not possess answers, all they can do is just open our eyes. In the course of working on this project, I became aware of this common vision that comes to artists from very different parts of the world. We are all human beings, we face the same problems, albeit in different environments. As a curator, I must make sure that all of this can be "read" by a sufficiently large audience and that a person could go home and think about what he just saw. But is there anyone who has universal answers? If only we could open our eyes wider, if only we could have more respect for the viewpoint of women… We have to learn to care. I don't want to generalize, but I would like to pay attention to the gesture of care, not something that shocks and divides. We need to somehow mend reality. And then there's cooperation. In the Manezh space I said to the artists that I will not give everyone a separate white cubicle. Yes, I will build walls, because you are not supposed to hang anything on the walls of Manezh, nothing can really be touched here. Yet on these specially erected walls they will have to be neighbours. It is also a story about how to deal with time and space at the same time. Did the artists meet and spend time together while the exhibition space was being prepared? Of course. Russians are incredibly hospitable. Everyone will be pleased to treat you to food and drink; people would provide dinners and we sat all together and communicated, discussed various things. And there was very good energy here. I believe in a flow of ideas and that ideas, as they communicate with each other and interact with each other, are giving us light. And I hope it can be felt here at the exhibition.